Our glass stair panels have become much more popular in the last few years. This is probably due largely to their light-giving properties which can make small spaces feel bigger and brighter – a particularly useful feature nowadays, given the meagre dimensions of many new-build homes in the UK. Mostly manufactured from 10mm thick toughened glass, our panels are normally made to measure, although some are available off the shelf. You can opt for multiple small panels with a 20mm gap between each one, or complete glass sheets with no gap. All our glazed panels are supplied with slightly bevelled (rounded) edges for safety. The panels can either be slotted into pre-cut grooves in the stair handrail and base rail or secured to the balustrade with metal brackets, depending on personal preference. To achieve a more minimalist effect, some home owners choose to dispense with a base rail and attach the panels only to the handrail above, so that they appear to float just above the side of the staircase – a stylish way to maximise light flow. If you want a real wow factor, we can even supply glass treads – with a non-slip finish, of course. 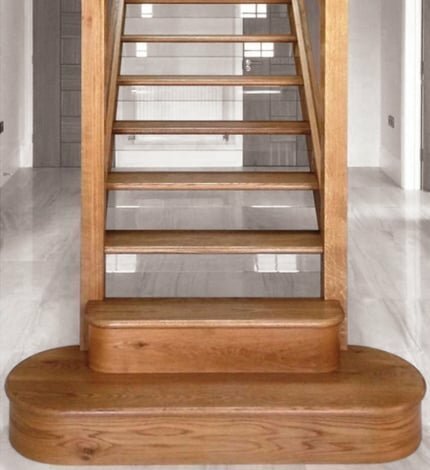 However, if you don’t want to go that far, consider combining wooden treads with glass risers for a discreetly modern look that won’t go out of fashion any time soon.